From its inception in 2009 as a Y Combinator start-up devoted to improving web analytics software, Mixpanel soon secured investments from Keith Rabois, Max Levchin, and Michael Birch. Now, their mobile analytics and web analytics tools analyze over 17 billion actions per month. 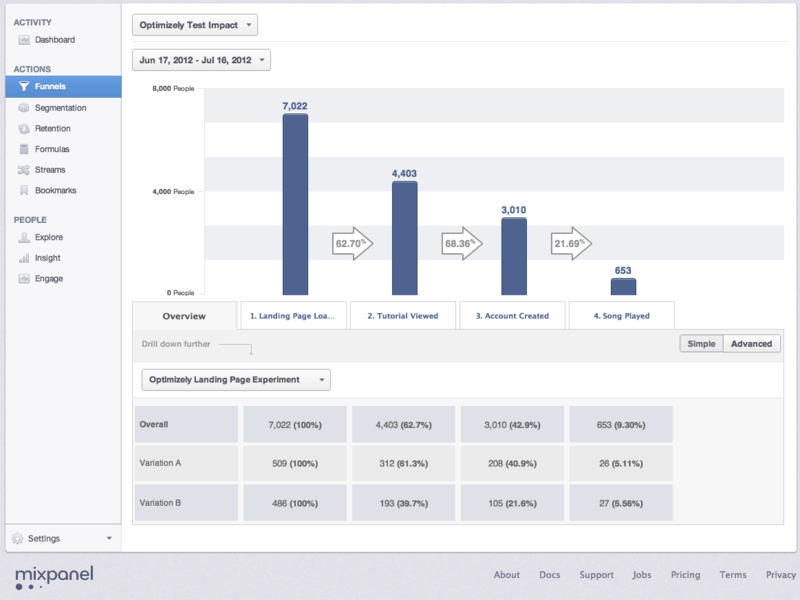 Mixpanel’s pricing for mobile analytics and web statistics tools are based on usage. This is important to small players who otherwise might not be able to afford the sophisticated real-time web analytics provided by an advanced platform like Mixpanel. Now all companies, regardless of size, can utilize advanced statistical tools employed by industry giants like Amazon.com, RosettaStone, eBay, and Match.com. Mixpanel knows that pageviews are not the best metric for monitoring customer engagement. Actions are key. Write emails instead of SQL commands to get at your app’s data with Mixpanel’s Mobile Analytics. Non-engineers can get the answers they need without too much technical know-how. Mixpanel’s query visualization tool makes it easy to create those emails. The software lets you get deeper into your data, even allowing you to learn about how users most invite consistently invite their friends. You can’t get this info from the simpler trend line charts, nor from canned reports. With a Mixpanel funnel, you can see more than the number of potential vacationers in Hawaii, but how many followed through with ticket purchases, how many dropped out of the process and precisely where they left off. Mixpanel’s retention reports show that customers value your applications. Act on what you learn and automatically send notifications to your customers on their mobile devices. Mixpanel makes a great resource for companies seeking to better understand their client base. Learn everything you need to know about Mixpanel. Our experts will reach out to you shortly.